Our most powerful sled pulling strap. A great tool for drag sled pulls, prowlers, tire pulling, and partner assisted resistance drills. 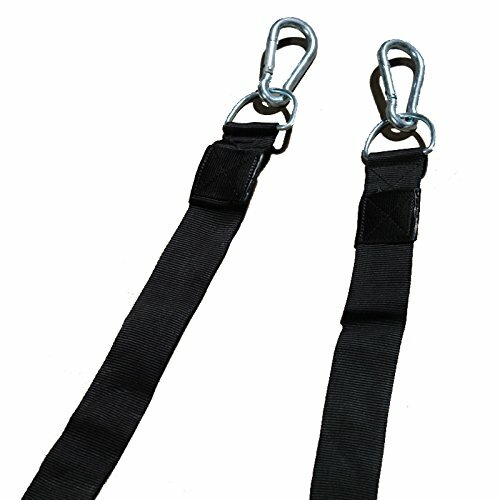 The 4" spring clips hook into belts, speed harnesses, and other athletic devices. Made of 2" wide heavy duty, non-stretch nylon material. Each nylon strap measures 8.5ft feet in length, which is perfect for sled pulling (trust us, we know). Only one strap is needed for most applications. However, we include a second for added security and flexibility. Also, some sleds have two connection points. We recommend connecting both cords no matter how light or heavy the load is. This is a high quality Workoutz product and carries a 1 year warranty against defects. Works great for pulling exercises, prowlers, sports conditioning drills, etc.